For a stellar season that included a trip to the Triple-A All-Star Game as well as his first big league promotion, C Danny Jansen has been named 2018 Buffalo Bisons Stan Barron Most Valuable Player. The Herd continued their annual Fan Appreciation Night tradition by announcing all their end of season player awards, including RHP Sean Reid-Foley earning both the Warren Spahn Most Valuable Pitcher and the 'Fremo' Vallone Community Service Award. For a second straight season, INF Jason Leblebijian was voted by his teammates as the Joe DeSa Most Inspirational Player while RHP Conor Fisk is the Bisons 2018 Jimmy Griffin Hometown Hero and RHP Brandon Cumpton is the Judge Michael Dillon Comeback Player of the Year. A Bisons season ticket holder since 1983, Paul Siska of East Amherst is the 2018 Joe Byron Fan of the Year. After splashing onto the Triple-A scene at the tail end of 2017, Danny Jansen earned his first Major League promotion in 2018 with an excellent season with the Bisons. In 88 games with the Herd, the backstop has averaged .275 (2nd on team), with 21 doubles (2nd), 12 home runs (2nd) and 58 RBI (1st). He also ranks in the Top 5 in the International League with a team-best .390 on-base pct. (4th) and a .473 slugging pct. (5th), leading the Bisons with 44 walks to only 49 strikeouts. Not only did Jansen represent the Bisons in the 2018 Triple-A All-Star Game, but he also hit a home run for Team USA in the 2018 Sirius XM Future's Game. Jansen has continued his excellent season since his promotion to the Blue Jays on August 12, reaching base safely in his first eight big league games. Jansen is the first catcher to be named Bisons MVP since Ryan Garko shared the award with OF Andy Abad after the 2015 season. The Bisons MVP award is named after Stan Barron, a legend in Buffalo broadcasting. With a breakout season at Triple-A, RHP Sean Reid-Foley earns the honor as the Bisons Warren Spahn Most Valuable Pitcher. In 15 starts with the Herd, the hard-throwing righty is 7-4 with a 3.50 ERA. Not only has Reid-Foley strike out a team-best 94 batters, he has only walked 27 and yielded just 68 hits in 82.1 innings of work. Reid-Foley won five consecutive decisions in a six-game stretch, posting a 2.00 ERA from June 26 through July 22. He also struck out 10 batters in just his second Triple-A start, May 29 vs. Columbus, and fanned at least five batters in all but three of his outings. His work on the mound helped Reid-Foley earn his first big league promotion as he allowed three runs in five innings of work in a loss on August 13 in Kansas City. The Warren Spahn Most Valuable Pitcher award was established in 2001 and is named after the legendary Hall of Fame lefty that was born in Buffalo, NY. What makes Reid-Foley's season even more impressive is he was the first to volunteer to represent the Bisons in the community, from visiting with kids at local area hospitals to sharing the game he loves with the players of the Miracle League. 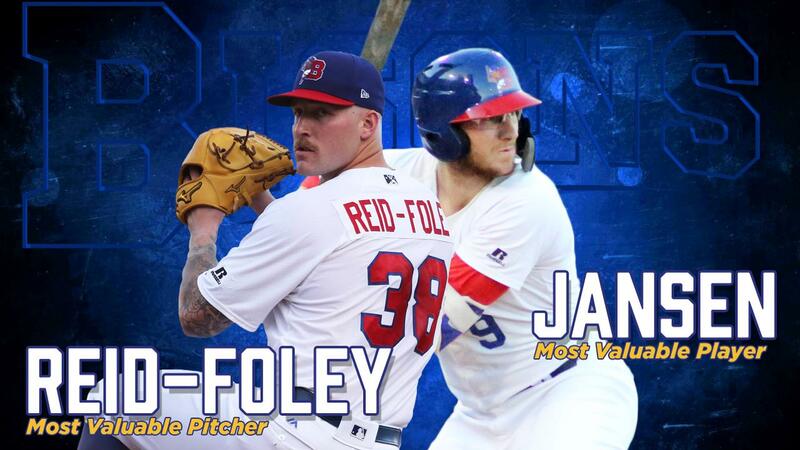 Reid-Foley becomes just the third player in the Bisons modern era to take home an MVP honor (Player/Pitcher) as well as the Community Service Award, joining Buffalo Baseball Hall of Famers Greg LaRocca (2003) and David Roberts (2000). The Community Service Award is named for the late Frank J. Vallone, the Bisons good will ambassador and most celebrated fan who served as a host and ticket salesperson from 1987-1990. For a second consecutive year, INF Jason Leblebijian was voted on by his teammates as the Most Inspirational Player. Going back-to-back is not unfamiliar territory for the fan-favorite as earlier in the season he became just the second Bisons player to play in consecutive Triple-A All-Star Games (Dorn Taylor, Ernie Young). In 79 games with the Bisons this season, Leblebijian has averaged .224 with seven doubles, 10 home runs and 41 RBI. He hit two home runs on May 25 against Rochester and launched a grand slam out of Coca-Cola Park in Lehigh Valley on June 11. The versatile fielder has played all four infield positions plus left field already this year, but injuries have limited him to just 17 games over the last two months of the season. Leblebijian joins catcher Tim Laker, pitcher Jeff Harris and catcher Mike Nickeas as the only Bisons to win multiple Most Inspirational Awards. The Joe DeSa Most Inspirational Player Award is named for the slick-fielding, power hitting player who was with the Bisons from 1985-86 and lost his life in a car accident in December of 1986. The award is voted on by the team and presented annually to the player who truly exemplifies the meaning of inspiration by his play and love of the game. RHP Brandon Cumpton's 2018 season is sure to be one the righty will never forget. After missing all of the 2015 and 2016 seasons because of a torn UCL and the resulting Tommy John surgery, Cumpton began this season pitching for the Southern Maryland Blue Crabs of the Independent Atlantic League. Then in July, the righty was signed by the Blue Jays and made five appearances for the Herd before an amazing week for the Augusta, GA native at the end of the month. Just seven days after the birth of his first daughter, Kylee Grace, Cumpton was promoted to Toronto to make his first big league appearance in nearly four years. Overall, with the Bisons, Cumpton is 2-4 with a 5.59 ERA and one save in 11 appearances and eight starts. The Bisons 'Comeback Player of the Year' award is named for the late Judge Michael F. Dillon, who was a three-time Erie County district attorney and served a 14-year term on the State Supreme Court. A 24th round pick of the Blue Jays in 2014 MLB Amateur Draft, RHP Conor Fisk began the season making his debut with Double-A New Hampshire. But it was his work in front of the hometown fans at Coca-Cola Field that has made the 26-year old a mainstay in the Bisons bullpen for the majority of the campaign. In 19 appearances at home this season, Fisk is 2-0 with a save and a razor-thin 0.82 ERA. In 33.0 total innings, he has struck out 23 batters and allowed just 26 hits, holding opponents to a .220 batting average and just one home run. He began his Triple-A career with 13.1 innings of scoreless baseball at Coca-Cola Field. Overall, Fisk is 3-4 with a 2.82 ERA in a team-high 32 games with the Bisons. The Hometown Hero Award was created during the 2008 season to honor the impact and support of the former Mayor of Buffalo, Jimmy Griffin. There was no bigger supporter of the team and of a downtown ballpark for the fans of the area than Mayor Griffin. Paul Siska of East Amherst has been a Bisons season ticket holder since the 1983 season, back when the Double-A Bisons played their games at War Memorial Stadium. When the Bisons moved to new Pilot Field in 1988, Siska helped found the 'Megaphone Maniacs,' and from their seats in the first row of section 112, made things very uncomfortable for visiting players. Recently retired from over 40 years of service with HSBC Bank, Siska is often seen at games with his wife, Connie, and daughter, Sara. When the Bisons are on the road, you can catch Siska watching the team on an MiLB.tv broadcast in his garage, which proudly showcases three and a half decades of Bisons memories. The Fan of the Year Award is named for the late Joe Byron, who is best known for singing the Canadian and US National Anthems at Buffalo Bisons baseball games and Buffalo Sabres hockey games.